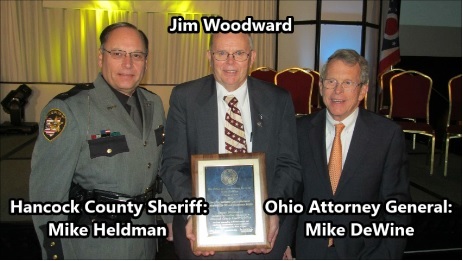 Jim Woodward, a member of the First UB church in Findlay, Ohio, received the 2014 State of Ohio Citizen Leadership award. Woodward is administrative chaplain at the Hancock County Sheriff’s Office. received the honor during a conference today for law enforcement. “Those receiving awards this year have all made tremendous contributions to their communities by valiantly saving lives and putting the safety of others before their own, by going above and beyond for community members, and by dedicating their lives to public service,” said Attorney General Mike DeWine. After studying the “Purpose Driven Life” book and listening to the complaints of the inmates, who said the weekly worship services and Bible studies were lectures on how “bad” they were, Jim decided to start his own monthly “motivational” gatherings with the inmates with community leaders. This morphed to “Celebrate Recovery” and eventually to a weekly worship service where, during which First UB’s pastor, Darwin Dunten, shares the weekly church sermon. The average attendance is 45-50 inmates from a population of 100. Officials have praised Woodward for his efforts at encouraging inmates during and after their incarceration. Woodward retired last year from his Razor’s Edge barbershop in Findlay after 49 years as a barber. He has also been awarded the Findlay Citizen of the Year award. Barbara Enfield, a longtime Women’s Missionary Fellowship president in the former Michindoh Conference, passed away on October 29, 2014. She was a member of Mt. Pleasant UB church in Angola, Ind. Chuck McKeown, pastor of UBIC Holly Hill, led the group in prayer to start the day. Prayer before starting a busy morning. Senior pastors at work. L-r: Mike Caley (Byron Center, Mich.), Derek Thrush (Harrisburg, Pa.), Andy Sikora (Berea, Ohio), and Daryl Elliott (Keyser, W. Va.). Polly Dunten, from First UB in Findlay, Ohio, in the sorting shed. In the sorting shed. L-r: Gloria Woods, Marty Helman, and Dean Bentz. 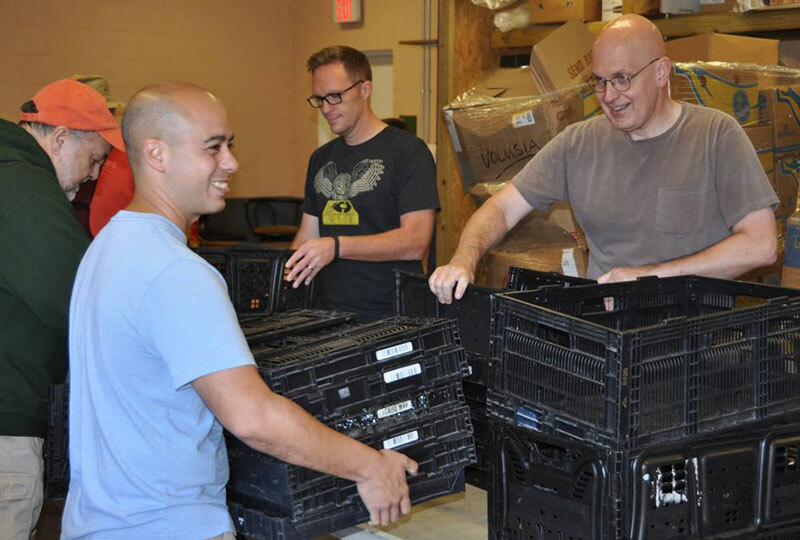 Andy Sikora, pastor of ReNew Ministries (Berea, Ohio), loading a box into a vehicle. A service project concluded the Pastors and Wives Summit held October 20-23, 2014, in Daytona, Fla. Everyone went to the nearby Holy Hill UB church to help with their food pantry. This is a huge operation, serving hundreds of people. The pantry is open every Tuesday and Thursday, Tuesday being the busier day. This was a Thursday, but there was plenty of work to do. The group arrived at the church at 9 am. Chuck McKeown, pastor of UBIC Holly Hill, greeted everyone, led them in prayer, and gave them instructions. 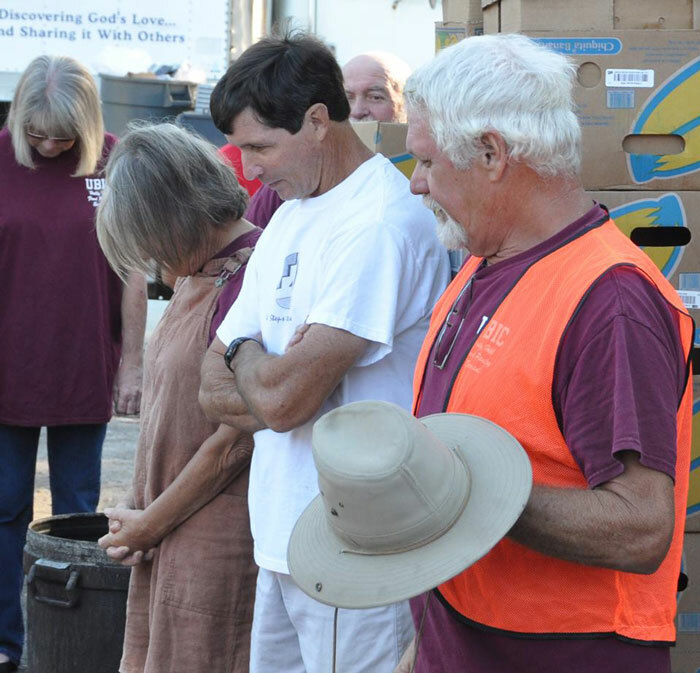 About half of the pastors and wives worked in an open-air building sorting food to be given out later that morning, while the other half worked in an enclosed building sorting food which would be taken elsewhere. They have a great system in place. Food is sorted into banana boxes and placed on a conveyor belt, which takes them outside, where the boxes are placed on large carts. The carts are then rolled to a covered shelter. From 10 am to 1 pm, cars enter the property, with a lane going on each side of the covered shelter. 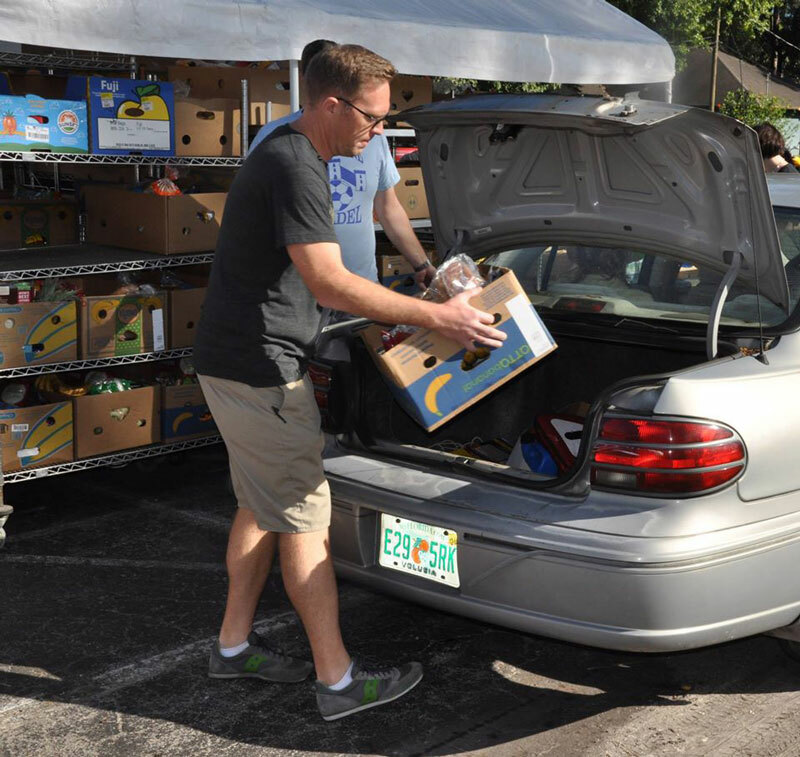 Volunteers load the vehicles with the boxed food and other items, like cleaning supplies. The food recipients don’t even need to leave their vehicles. 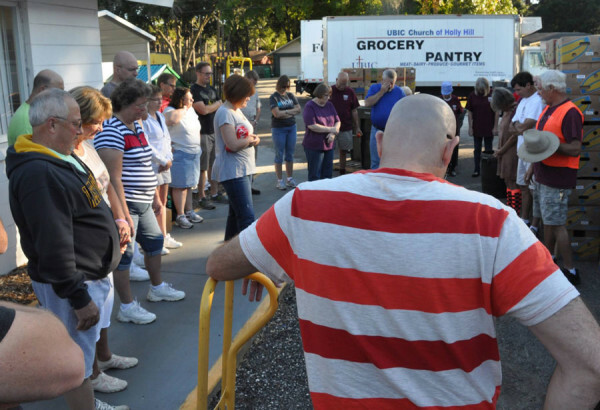 Originally, the church opened the pantry for anyone. However, they were drawing people from all over the region, and it became unmanageable. So, they restricted it to persons from Holly Hill. As cars arrive, volunteers screen them to see if they are from Holly Hill and if they qualify for the free food. 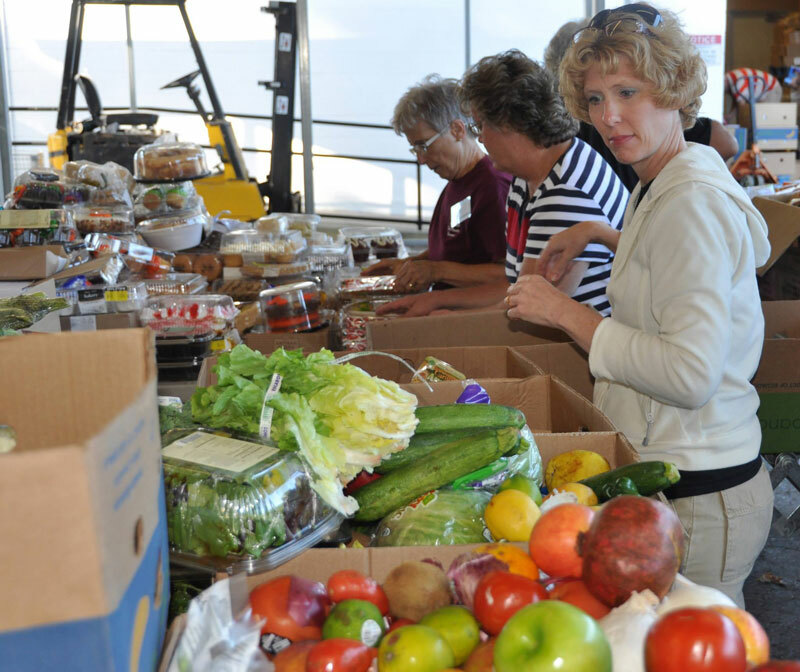 It’s quite an operation, and it takes a large number of volunteers plus a lot–a LOT–of money. The church owns several large trucks (one of them refrigerated) which can pick up donated food and also take left-over food to other places. 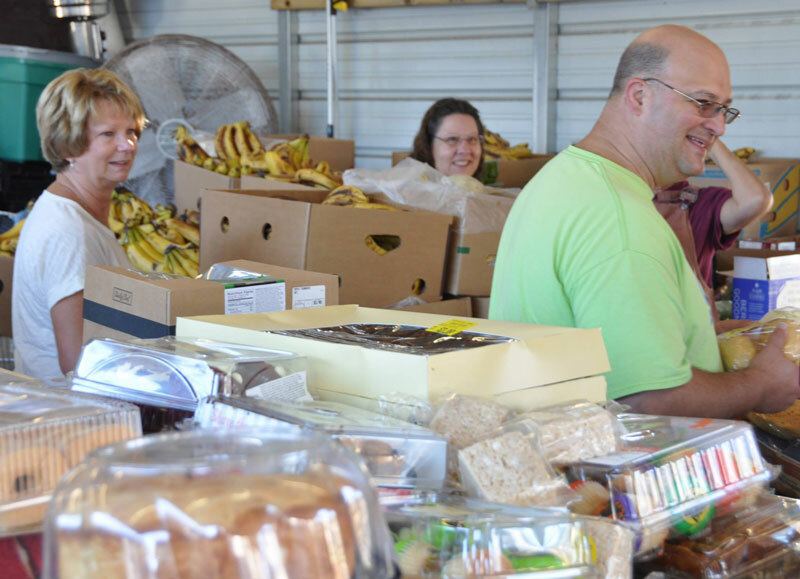 The food pantry also serves hot meals to the homeless and prisoners–nearly 12,000 meals in 2013. Retail value of food given away: $2.2 million. Total pounds of food distributed: 1.2 million. Over 100 photos from the food pantry service project have been posted on the UB Facebook page. 27 Oct Pastors & Wives Summit 4 Underway in Daytona, Fla.
Around the table, l-r: Art and Deborah Page (Salem UB, Chambersburg, Pa.); Gary and Rhonda Dilley (College Park UB, Huntington, Ind. ); Annette and Dennis Sites (Jerusalem Chapel, Churchville, Va.); Chris and Keri Little (Mt. Pleasant Church, Chambersburg, Pa.). Around the table, l-r: Mark and Carla Wilson (Fowlerville UB, Fowlerville, Mich.); Jeremiah and Elisa Ketchum (Brown Corners UB, Clare, Mich.); Bishop Phil and Sandy Whipple; Matt McKeown (First UB, Holly Hill, Fla.). 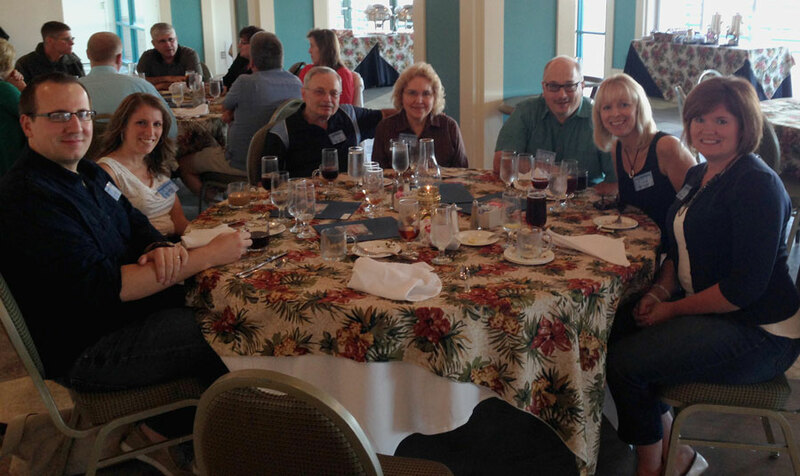 Around the table, l-r: Jason and Mary Garwood (Colwood UB, Caro, Mich.); Lester and Linda Smith (Hillsdale UB, Hillsdale, Mich.); Marty and Amy Pennington (Mainstreet Church, Walbridge, Ohio); Lisa Fetters, wife of National Ministries director Todd Fetters. 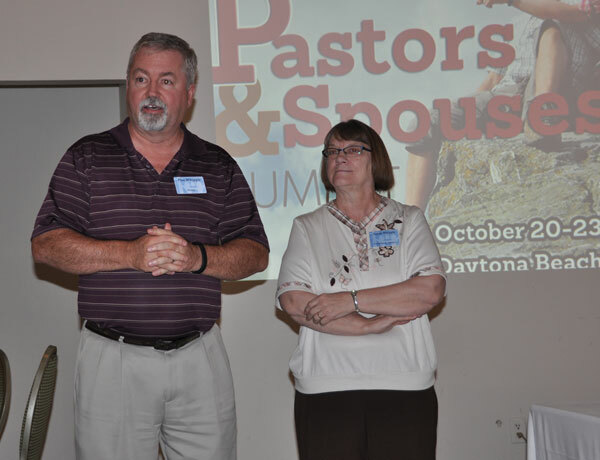 The fourth, and final, Pastors Summit began Monday evening in Daytona Beach, Fla. They will meet through Thursday, October 30. This event is for pastors and wives from our largest churches, those with an attendance exceeding 300. 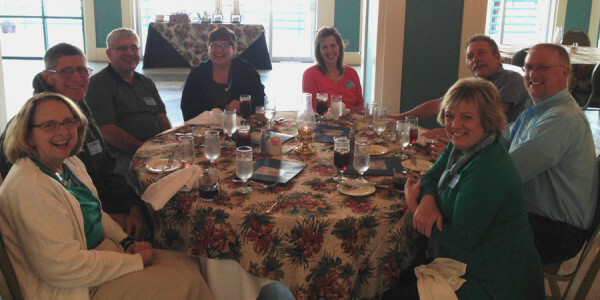 Last week, pastors and wives from churches of 150-300 attendance met at the same hotel along the ocean. 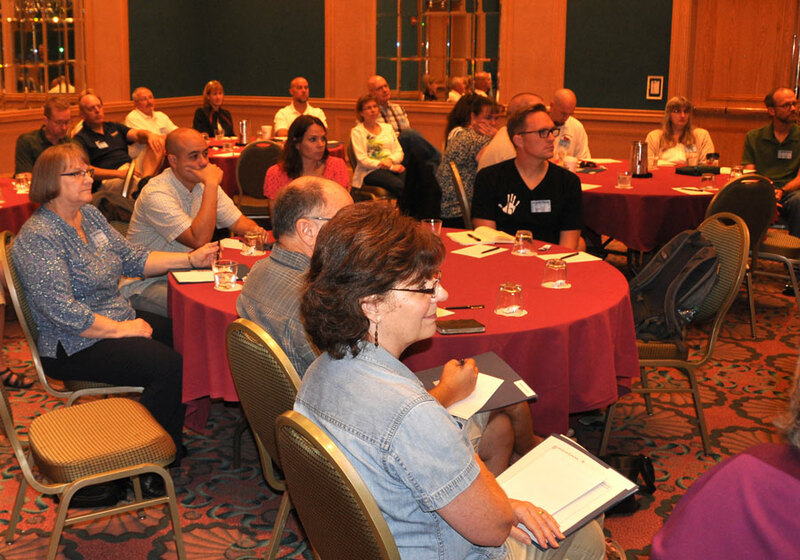 Summit for pastors from churches under 150 attendance were held in April and May. A total of 22 persons are attending this week. They include 9 pastoral couples, plus four persons from the UB National Office–Bishop Phil and Sandy Whipple, and National Ministries director Todd Fetters and his wife, Lisa. The group began meeting with supper on October 27. 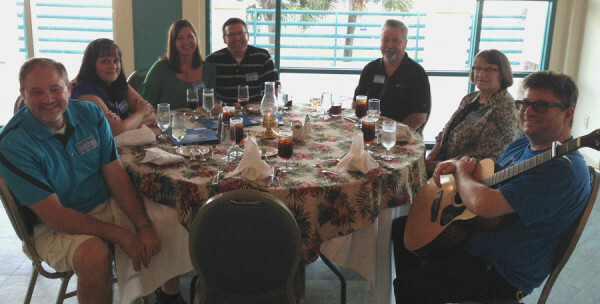 After the meal, Matt McKeown, associate pastor of the United Brethren church in nearby Holly Hill, led the group in worship. Then Todd Fetters led a get-better-acquainted time, during which each person/couple told a bit about themselves. Bishop Phil Whipple will speak to the group on Tuesday morning, and Marty Pennington, pastor of Mainstreet Church (Walbridge, Ohio), will lead a session on Wednesday morning. First UB in New Castle, Pa. (8 years). Mt. Zion UB in Wayne, Ohio (26 years). After retiring in 1988 he became Pastor of Visitation at Mainstreet UB church in Walbridge, Ohio. His wife, Dolly, whom he wed in 1941, passed away in 2011. Visitation: 5-8 pm Thursday, October 31. Visitation location: Dunn Funeral Home, 408 W. Wooster Street, Bowling Green, Ohio. Funeral: 11 am Friday, October 31, 2014. Funeral location: Mt. Zion UB church, Wayne, Ohio (corner of Bays and Reynolds Roads). Rev. Kenneth Graham will officiate at the funeral. Justin Marva, superintendent of Administration and Finance for Sierra Leone Conference. The following update was sent to Jeff Bleijerveld, Director of Global Ministries, on Wednesday, October 22. The Ebola situation is still ravaging the country. The flash points at the moment are Waterloo, Makeni, Port Loko, and Shenge. We have got military personnel from England to help us fight the disease, but people are still not following the safety precautions. They are still washing dead bodies and conducting burials at night. Nurses and doctors are also infected because they are not taking the necessary precautions. However there is much improvement in areas like Kenema and Kailahun where the outbreak first started. There was a riot yesterday in the eastern district of Kono among youth and police because they wanted to take away a 90-year-old woman who was suspected to be Ebola positive and the youth refused to hand over the old woman to them. The Defense minister of Sierra Leone has now been appointed by the president as the Chief Executive Officer of the Ebola Response Team in Sierra Leone. Right now Kenema, Moyamba, Gbangbaia, and Taninahun are quarantined areas where United Brethren churches and schools are located. The second-largest city, Bo, is relatively quiet with minimal cases, but all other private health facilities are closed. It is difficult to buy drugs for even headache. Please continue to pray for us as a church and as a nation. Todd Fetters opening the Tuesday morning session. Bishop Phil and Sandy Whipple. During the Tuesday morning session. L-r: Marc Stephenson (Chambersburg, Pa.), Jim Bolich (Shippensburg, Pa.), and Milt Herrold (Greencastle, Pa.). The third Pastors Summit is in progress in Daytona Beach, Fla. This one is for pastors and wives from churches with an attendance of 150-300. 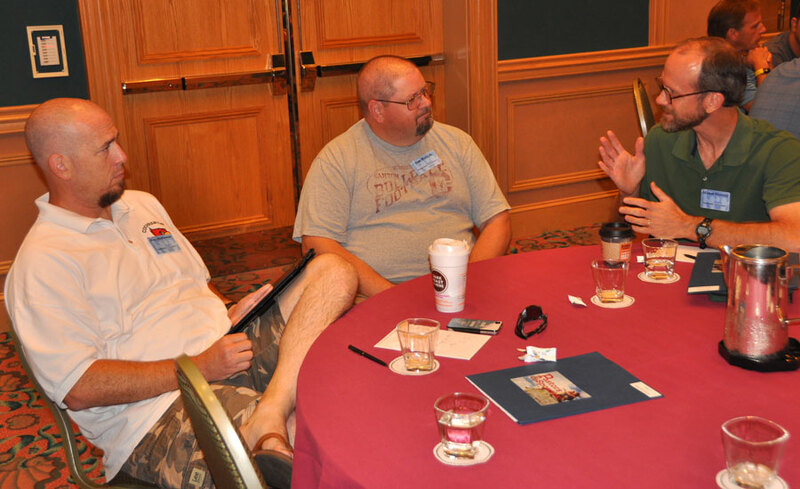 Next week, pastors and wives from churches of 300+ attendance will meet at the same hotel in Daytona Beach. It’s designed to be a time of learning and challenge, but also a time of relaxation–a get-away–for pastors. There are a total of 44 persons. Twenty of them are pastors, and 17 are pastors wives. Seven people from the national office are also attending–Bishop Phil and Sandie Whipple, Jeff Bleijerveld, Todd and Lisa Fetters, and Steve and Pam Dennie. The group began meeting with supper on October 20. After the meal, Matt McKeown, associate pastor of the United Brethren church in nearby Holly Hill, led the group in worship. 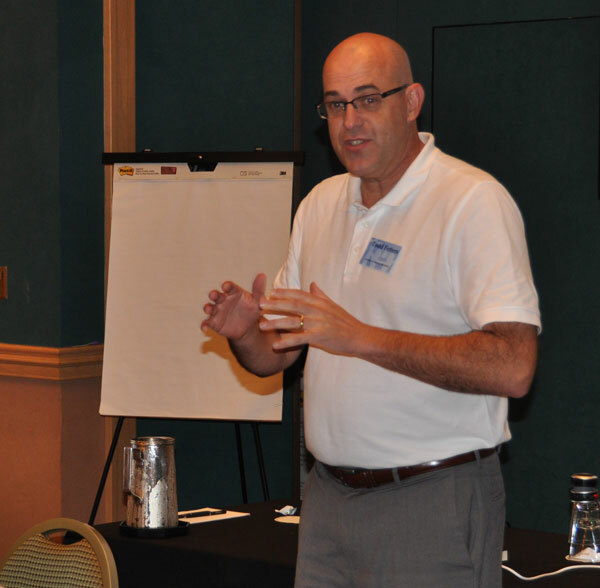 Then Todd Fetters, director of National Ministries, led in helping people get acquainted with each pastor and pastoral couple. On Tuesday morning, Bishop Phil Whipple spoke during the opening session. After a break time, Lisa Fetters convened all of the pastors wives for a separate time together, while the pastors participated in a discussion time. Everyone had all afternoon and evening free. It was a great first day. A number of photos have been posted on the United Brethren Facebook page. Rev. Dave Stephens passed away Thursday night, October 16, 2014. He was an ordained United Brethren minister, former UB pastor, and for 25 years, director of Camp Cotubic in Bellefontaine, Ohio. With his family at his side, dad passed away on October 16th at 8:00 pm. He’d battled cancer for a year and fought the good fight right up to the end. Dad was such a great man and had a way of making everyone he came in contact with feel like they were family. He was truly a man with the heart of Christ…. God blessed him with a great stage in Camp Cotubic to simply love on people, and that’s what he did every day. He loved the camp so much and gave his heart and soul to it every day for 25 years. God gave Dad a vision 25 years ago, and he worked hard to see that vision come to pass. A couple years ago, Dad sat down and tried to figure out the number of kids that have come through the camp. He quit counting once the number of kids reached a number that would fill Ohio Stadium. Dad has left us with a great example we all should follow in how to treat others. He always left people better than he’d find them. As I sit here I can’t help but imagine what Dad is seeing right now. He understood this earth isn’t home and looked forward to seeing his Lord and Savior Jesus Christ, and he also looked forward to seeing his earthly father who passed away in 1984. We, the Stephens family want to thank everyone who has shown us so much love. It has truly been overwhelming to see the number of people Dad has touched come and love on us over the last year of his battle with cancer. We love you all so much and couldn’t have made it through this without you. Know we’re doing fine and are celebrating as we know where Dad is and who he’s with now! No more pain, no more tears, and no more cancer. Funeral details will be posted when available. Tentatively, the viewing will be held Monday, October 20, with the funeral on Tuesday in Bellefontaine, Ohio. The Executive Leadership Team, during its October 13-14 meeting, approved the Pastoral Compensation guidelines for 2015. Many UB churches use this formula to set salaries and budgets for the coming year. The minimum fulltime salary (called Standard Base Salary) for senior pastors was set at $37,981 for 2015. This is an increase of 1% over the 2014 figure. The Standard Base Salary is only the starting point. Other factors–such as experience, education, church attendance, staff size–add to the base salary. Benefits such as parsonage, utilities, SECA, insurance, and pension round out the total compensation package. To be a fulltime pastor, the compensation package must meet all of these criteria in full. If a church cannot meet these guidelines, a pastor may pursue supplemental employment to achieve the compensation level. Pastors are highly encouraged to register for the Prepare/Enrich Certification Training being held at the UB national office on Thursday, October 23. This class will provide excellent insights and tools for premarital and marital counseling. Pastors and counselors regularly engage in pre-marital and marriage counseling. A special class is being held October 23, 2014, to help persons become more effective in this area. You can still sign up. Location: UB Headquarters, Huntington, Ind. Provide useful feedback to couples. Work more effectively with couples. The instructor is Dr. Steve Lee, a former professor of psychology at Huntington University who went on to become an instructor at Focus on the Family Institute and a Certified Relational Wisdom Instructor.